It would be easy to argue that the rise of the contemporary artist’s book is a reaction against the increasing digitization of the world of words. Indeed, in many ways, this is true. But the rise in digital content has created a culture that’s comfortable with a saturation of words, ideas, and information—the kind of comfort level it takes to look at and appreciate artists’ books. The entire notion of what may be defined as a book has been upended. No longer is it a bound block of printed pages. The physicality and beauty of artists’ books—their distinctive form—serves to explore content that ranges from political to personal, from arcane to universal, from banal to earthshaking. What artists’ books have in common with their traditional counterparts, generally, is to serve as vehicles for a story (though rarely a conventional narrative), to reflect on contemporary culture, and to frame history and memory. Exhibitions of artists’ books or bookish art are content-rich and often text-driven. They demand extended attention, and a willingness to read, and to turn pages where actual pages exist. When In Retrospect: Artists’ Books by Maureen Cummins, Ann Lovett, and Nava Atlas began its tour in 2010, I worried about audience engagement with our books and related wall pieces, which are not only full of text, but present challenging themes. My concerns proved baseless, as students and public alike took the time to examine, peruse, and reflect. Ann Kalmbach, executive director of Women’s Studio Workshop (Rosendale, New York) offered a plausible theory as to why audiences engage so readily with artists’ books: We’re all trained early in our lives to digest words, and in the book arts, the use of text leads to greater comprehension of the images, as well as appreciation of the concept as a whole. Even in artists’ books more sculptural than text-driven, there’s a layering of ideas, and such works may be pondered long after a painting, or other image-only medium, has been encountered. A number of significant exhibitions in New York and New England featuring artists’ books and bookish subjects have been on view this year. An exhibition of Ed Ruscha’s seminal books, notably his Twentysix Gasoline Stations (1962), and the legions of photographic books inspired by him were featured at the uptown branch of Gagosian Gallery. Ruscha’s examples of cheaply printed, affordable (at the time) editions were clearly recognized as books, if “unorthodox” ones. At the other end of the spectrum, the Museum of Modern Art recently mounted Wait, Later This Will Be Nothing: Editions by Dieter Roth. Roth was a pioneer in total subversion of the book form, with influential works such as Literature Sausage, a pulped book mixed with onions and spices and stuffed into a sausage skin. Increasingly, artists’ books or book-like objects inform exhibitions, as was recently the case of Day After Day: The Diaristic Impulse at the University Art Museum at Albany. 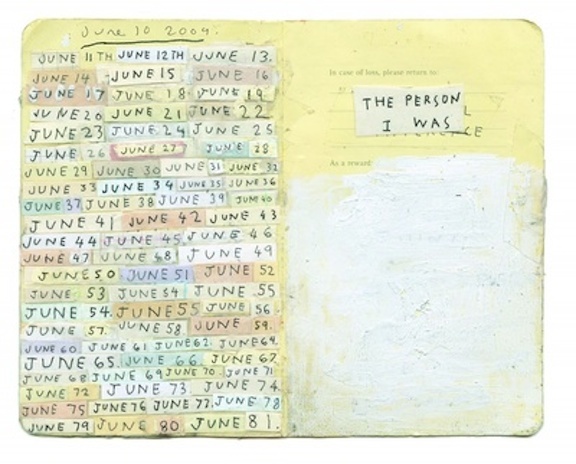 The capturing of memory and daily experience was evident in a number of media, but the inclusion of a moleskin notebook installation, artists’ sketchbook pages, a concertina book, and yes, an actual (though eccentric) diary gave this exhibition a bookish flavor. Photo-Rapide: François Deschamps at the Samuel Dorsky Museum at SUNY-New Paltz featured Deschamps’s stunning wall installations of portraiture influenced by the Malian tradition. Displayed alongside them were several of Deschamps’s impressive photographic books conveying his yearlong immersion in Mali. Creating handmade or limited edition books is a gentle subversion of the mass-produced book model associated with the publishing industry. Of course, the use of digital tools to craft artists’ books is a gentle subversion as well. While many book artists treasure and preserve age-old techniques such as letterpress and traditional printmaking, others embrace new technology. Archival inkjet printers and computerized layout programs live side by side with their age-old counterparts, or they are sometimes used in tandem. Finally, while the traditional book is being tested by the rise of e-books, this challenge is fueling a mini-renaissance in the appreciation of the finely made codex as an object of value and beauty. At the same time, book artists are deconstructing the traditional definition of “book.” At the center of this transformation and redefinition is the urgent desire to spend time with words, images, and ideas on paper, and to gain a restorative experience away from the screens and devices that dominate our daily lives. My interview with Vicky and Bill Stewart of Vamp & Tramp Booksellers, preeminent dealers of contemporary artists’ books, provides an overview of the field. When Vicky and Bill, a corporate VP and a lapsed high school English teacher, began Vamp & Tramp in 1995, they were not aware of artists’ books. Today, they represent over 400 contemporary fine presses and book artists and spend most of the year traveling around the U.S., showing the books they represent to private and institutional collectors. This interview was conducted on April 19, 2013. 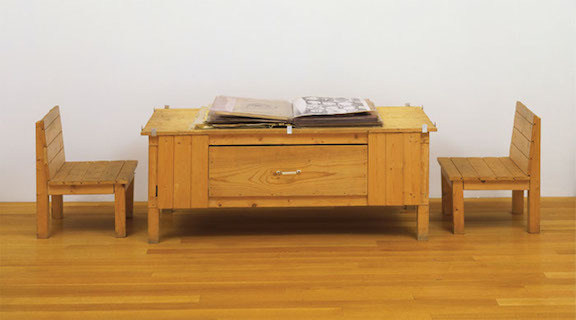 NA: Are fine editions distinctly different from artists’ books, or do the two fields overlap? If so, in what way? 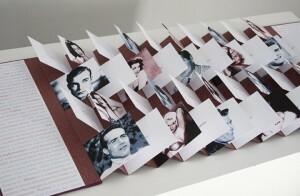 V&T: Artists’ books are works of art realized in book form, and the connection to bookness is often tenuous and debatable. The boundary between fine press and artists’ books is ambiguous, but they’re connected by their fundamental insistence on the physical object. For us, fine press books are those in which the physical book—the paper, the printing, the arrangement of words and image on the page—honor the text. They are mostly codex in format. They are books my parents would recognize as books. Artists’ books push the definition and concept of bookness. Our personal and comfortably ambiguous sense of artists’ books is this: Artists’ books begin with a sense of the book—that passive, practical, and elegant container for storing and retrieving story and information—and then they push that envelope. The physical book is no longer just the container for a story or information. With artists’ books, the physical aspects of the book become an expressive component of the aesthetic experience, on par with story, information, image. With artists’ books, to rephrase Barry Lopez’s elegant metaphor, it’s as if the goblet becomes the wine. 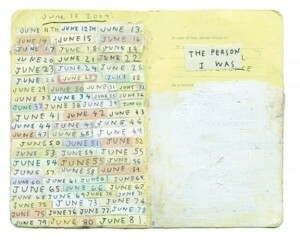 NA: At first glance, it seems that women are dominant in the phenomenon of making artists’ books. Though the field is hardly gender exclusive, do you observe a female dominance in this medium? V&T: If you look only at the artists and presses represented by Vamp & Tramp, admittedly a small and biased selection, it’s true that women represented outnumber men. Our suspicion is that this is so for economic reasons. Few people are making a living from their artists’ books; no one is getting rich. NA: When did you start seeing exponential growth in the artists’ book field? NA: How do you explain this most recent growth and interest in the field of artists’ books? V&T: Our guess is this is a reaction to the virtual world that is the double-edged sword of modern life. Most of us spend time each day in some sort of virtual environment. The benefits are unquestionable, but it’s a bittersweet world. For the most part, contemporary artists’ books resist virtualization. Most insist on hands-on experience. Artists’ books remind us that even virtual reality is a substitute for, or alternative to, material reality. The material world is bittersweet, too, but to deny or avoid it seems to leave a void. Artists’ books help fill that void. In these days when screens are replacing paper at an operatic rate, artists’ books resist the onslaught. Artists’ books defy translations into other media, be they catalogues, two-dimensional images, or video. The physical artifact is essential to the experience. Take away the physical and you’ve not only gutted the experience, but turned the cadaver into a ghost of itself.